This action figure shows the "True Colors of a Hero"! Mark Lee stands about 12-inches tall and sports over 30 points of articulation! From the 1986 triad crime thriller A Better Tomorrow. Comes with interchangeable hands and multiple costumes and accessories! 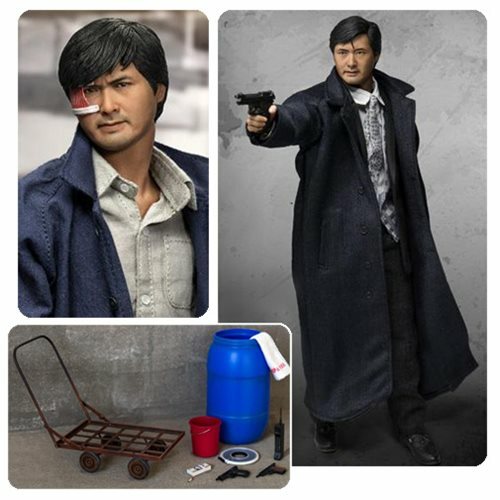 From Hong Kong film director John Woo's classic 1986 triad crime thriller A Better Tomorrow, comes this amazing A Better Tomorrow Mark Lee Real Masterpiece 1:6 Scale Action Figure featuring an impeccable likeness of actor Chow Yun-fat. The detailed Mark Lee figure stands about 12-inches tall and sports over 30 points of articulation. There are 2 different head sculpts - classic and battle damaged - both with wrinkles and a lifelike skin texture. These sculpts are hand painted with a multilayer paint application. The figure also comes with interchangeable hands, multiple costumes, and plenty of accessories to recreate scenes from the movie! Ages 15 and up.